Firstly, there’s the conventional approach. Your GP might prescribe medications - selective serotonin reuptake inhibitors (SSRIs) and norepinephrine reuptake inhibitors. Many people try them and find they ease some of the anxiety, but personally, I never got past the first few days. I felt like a feather cast around on the wind – my mind out of my control. There’s a great website that shares experiences and peer reviews of these types of medications so that you can read about some of the side effects and benefits that others have faced. Other people seem to get on with them a lot better than me! Other standard NHS approaches are cognitive behavioural therapy – you get referred to ‘IAPT’. This as a ‘catch all’ service and doesn’t provide targeted cancer-related support. The other option is clinical health psychology. In my area, the latter prioritises those in the early stages of diagnosis rather than those in recovery, so the waiting lists for survivors can often be quite long, though worth it. Interestingly, in a Cochrane review, researchers found that yoga actually decreases anxiety levels more than standard psychological counselling services. And in a very small Japanese study (only 28 people), they found that after only two weeks of yoga, anxiety levels improved. The participants spent one session learning the techniques, and then the following two weeks following a CD at home. Now, before you start thinking we’re going to go off on one about the importance of a positive mental attitude here – all that ‘keep smiling’, ‘keep your chin up’, ‘appear cheerful’ stuff… NOPE. We aren’t. Instead, we’re going to focus on the importance of feeling purposeful. Ryff & Singer (1998) argue that those who experience ultimate positive wellbeing are those who perceive themselves to reach their fullest potential in life. These people feel productive and have life-long passions, and stressful experiences like cancer seem to prove less damaging to the psyche. They proposed the Scales of Psychological Well-being – factors that contributed to overall good health. These included activities associated with being independent, having a purpose in life, self-acceptance, personal growth and development, having positive relations with others, and mastering one’s environment. Holland & Holahan explored the difference between ‘approach’ coping strategies and ‘avoidance’ coping strategies. ‘Approach’ coping mechanisms include assertive problem-solving, confronting issues, seeking social support, and making constructive judgements about the world. 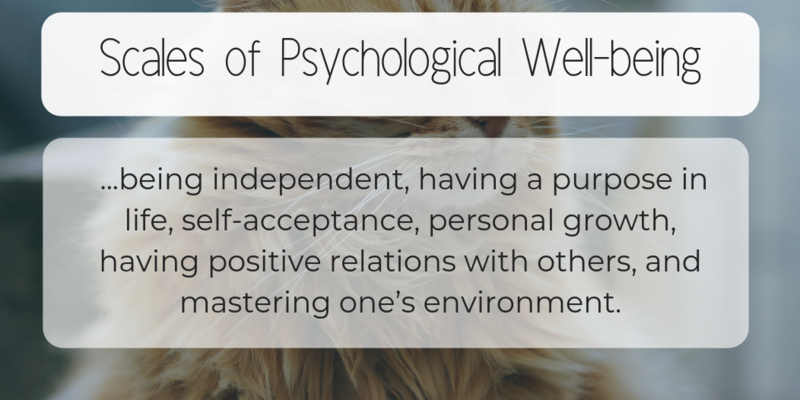 They found that these approaches resulted in a much higher level of wellbeing. Meanwhile, ‘avoidance’ coping strategies, like distancing, high levels of self-control, escape avoidance, and accepting responsibility resulted in lower levels of personal wellbeing. EFT is an interesting one, combining cognitive therapy with tapping or acupuncture. Clond’s systematic review of 14 studies found that EFT significantly decreased anxiety and it looks like some areas even recommend it through the NHS. Derbyshire Community Health Services provide a full description of the therapy, explaining how you go about doing it to yourself. It sounds a bit barmy – you basically think of something you’re anxious about and start tapping yourself on specific parts of your body. Another systematic review found that hypnosis can have a dramatic ‘significant and immediate’ effect on the anxiety levels of those facing cancer. The review found that children were even more receptive to hypnotic treatment than adults – presumably because of they respond better to suggestion. Those who received therapist-delivered hypnosis were 3x more likely to experience positive effects than those receiving self-hypnosis, or those listening to audio tapes. This may be because of environmental noise, or because people do not reach as deep a trance by themselves. The review found that the length of time that hypnosis lasted wasn’t relevant, with those receiving hypnosis for under 30 minutes experiencing the same benefit as those over 30 – something to consider if you invest in hypnosis yourself. Twelve weeks of exercise results in decreased anxiety according to a Cochrane review. They assessed a variety of activities, including walking, swimming, running, resistance training, yoga, tai chi, and pilates. Activities included both individual and group activities, those led by professionals and those not, and activities based both at home and at activity centres. What they didn’t identify was which type of activity was most effective. Neither did they drill down on the particular details of interventions – surely this is the most useful bit?! 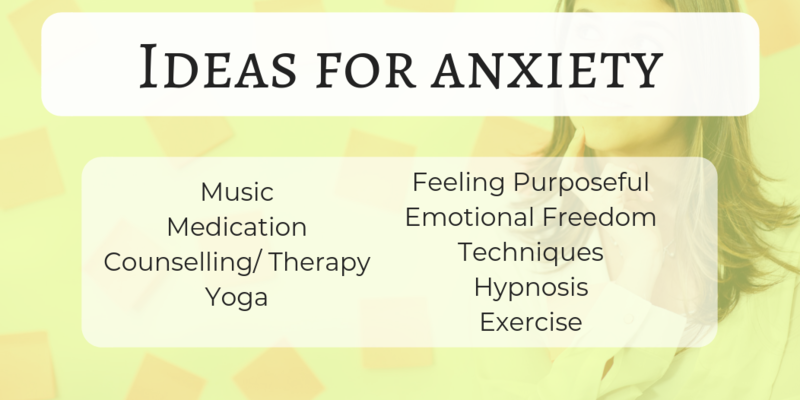 In fact, there are many massive gaping holes in the field of anxiety research. Behaviour changes that have quite demonstrative positive effects on anxiety levels seem to been sparsely researched, presumably because there’s just no money in it. Reducing coffee intake, for example, can often have a great impact on my psychological stability. More than one cup a day and I’m a jabbering wreck. Just one mug from Costa Coffee (they must use far too strong coffee!) is enough to make me crave a day long bear hug. But is there a decent research study on the link between anxiety and coffee – not that I could find! It’s the same for music, which can have a dramatic influence on mood. There seems little exploration of how counselling linked to music therapy might help, beyond this brief study. And it’s not just the focus of research papers that need a bit of a kick, but the way they’re written and the information they share. Of course, we all want to know how effective a particular treatment is, but don’t we want to know the details? Wouldn’t it be grand if ‘patients’ were empowered with the information so they can go forth and explore effective treatments themselves? How was the treatment delivered… how long for… what precisely does it involve… some instructions… access to the materials the researchers used, like intervention CDs? Why isn’t this useful information available? Next: The Meaning of Suffering?